This early work on Martin Luther is both expensive and hard to find in its first edition. It details the life of the monk responsible for translating the Bible from Latin into German and for inspiring the Lutheran movement. This is a fascinating work and is thoroughly recommended for anyone interested in the history of European religion. This book is about the life of Martin Luther and his continuing impact on the world. Luther is raised in a conservative and disciplined home and goes on to become a monk without his father's initial blessing. Luther does everything a monk should do. He is committed to prayer, fasting, vigils, preaching, and teaching to the point of exhaustion. He continues his education and goes on to become a leader in the Catholic Church. I consider myself a Lutheran (LCMS). If you consider yourself a Lutheran, I recommend this book. If you are interested in religion, and you can handle something harder than Teachings of Don Juan, I recommend this book. If you are looking for a biography, I am not sure whether to recommend this book. It explains why Lutherans do some of the things that they do, and why they don't do some of the things that they don't. I don't want to spoil anything, but I didn't expect Martin Luther to have a sense of humor. Many surprises in this book. I would like to tell one or two, but again, no spoilers. The doctrine-and-dogma section that takes up a few chapters after the middle of the book is hard to read (not as hard as Krishnamurti), but the action picks back up after that. The author's vocabulary was frequently above my head, and I am long-educated. Notice I did not say well-educated. The book suggests other works to read. Apparently many of Luther's sermons are accessible. Considering that the author died in his 90's, a third of a century ago, this book holds up well. My pastors tell me that this is the popular Luther biography and an easy read compared to others. What others, I don't know. I accidentally bought the book on paper. It was 400 pages, not including the extensive bibliography. It has 22 chapters, with many black-and-white illustrations. 400 divided by 22 is 18, and by golly, the chapters are all close to 18 pages. I have a copy of the 95 Theses printed on both sides of an 8.5x11 sheet of paper. I used it as a bookmark. Good idea! Excellent telling of the fascinating life of an amazing man. Pleasurable prose (1950) modern authors have lost. Unbiased and factual, author spans the good-bad & ugly. Never realized how mercurial Luther was ... a loose cannon whose angry salvos were brilliant and intellectual. Final chapter focuses on three controversial positions but explains Luther's thought process plus historical circumstances, which we disregard when looking back from our 21st century to judge historical persons. Author doesn't apologize for Luther, he explains him. Shakespeare wrote "some are born great, some achieve greatness, some have greatness thrust upon them" ... and then there is Martin Luther. I started to re-read an old paperback version of this book on my bookshelf - remembering how much I enjoyed it years ago. When I was half way through, the book began to fall apart. By then, I was thoroughly absorbed in the well-written story. I decided I better get a fresh copy. I am not a religious person, but I am interested in courageous people who have changed history, and Martin Luther is one of those people. Also, I was curious: why had Martin Luther King Jr. been named for this man? 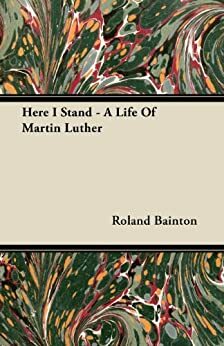 The book chronicles Martin Luther's life-long challenge to the Catholic Church, the many obstacles in his way, and the careful thought he put into his own interpretation of the New Testament - and the teachings of Jesus. The Catholic Church during Luther's time controlled all of Europe, essentially through the widespread fear of hell, and the rule of priests and bishops who stood between each person and God/salvation. The Church sold "indulgences" to everyone, from rich Princes to poor peasants. The indulgences promised that salvation could be purchased with stipulated amounts of money. With the money, the Church built huge cathedrals, bought extensive property, and gathered wealth to Rome. Luther set out to challenge this "rule by fear" and also the church rituals that separated each person from a direct connection with God. Challenging this kind of power and corruption took enormous courage, and MLK Jr.'s parents must have had this in mind when they named their son several centuries later. Both men defied enormous power, and the rule of fear. Another interesting connection with our time is the challenge Martin Luther made to "celibacy." As a monk, Luther lived into his middle years celibate (we presume). However, he concluded in mid-life that Jesus did not require men to be celibate, quite the contrary. Following his own conclusions, Martin Luther married and had many children, and seemed to enjoy life as a family man. Monasteries emptied where Protestantism prevailed. It will be interesting to see if the Catholic Church revisits this question in our modern times. I loved this hardback edition. The text and many woodcut illustrations are a joy to look at. The book itself is a classic. The story is well written, and fascinating. This is what a book used to be, and can still be. Well written and very informative. This is one of the very few books that I couldn’t put down. I found this book so interesting that I couldn’t wait for the work day to end so I could go home and read some more of it which I do believe was due not only to how well it was written but to how incredibly interesting his life was. It would almost certainly have to have been interesting since he was the one who practically launched the Reformation. I’ve watched a couple of programs about Martin Luther and this book answered questions that those programs left me with. I’ve been a Christian for 30+ years and this is the first time that I’ve read a biography of ML and I now realize that I was much poorer for not doing so. My previous knowledge about ML was rather superficial and only now do I realize that there was so much more that was significant as to what he has done and how he affected his time and afterwards. Well worth the five star rating!